Hi friends! Today’s review (I know, the second day in a row, whaatt??) 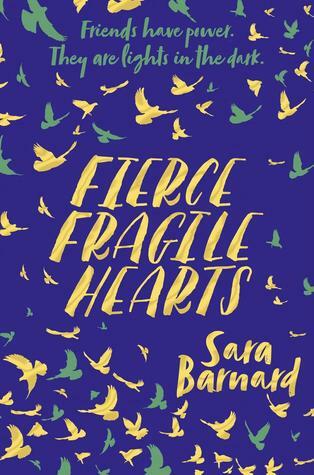 concerns the brand new sequel Fierce Fragile Hearts by Sara Barnard. It’s the second instalment of the Beautiful Broken Things series. Now, I personally never read Beautiful Broken Things but I’ve heard enough about it that I found that my experience wasn’t hampered by this fact. This is one of the main reasons as to why I wanted to read this novel! Fierce Fragile Hearts actually takes place two (2) years after BBT and it concentrates on the character of Suzanne. BBT is where we were introduced to Suzanne, Caddy and Rosie and their journey and friendship, and it was told from the perspective of Caddy. The fact that this novel was told from Suzanne’s perspective provided the reader with an in-depth understanding of her character and the emotional and mental abuse she has been dealing with. Here, I should state that there is a trigger warning for this book because it deals with the aftermath of abuse. So, make sure you take care when reading. Suzanne’s story was extremely important. The trauma and effects of parental abuse were explored, considered and described painstakingly in a way that did not demean nor was inappropriate. The level of emotionality tore me to pieces. Suzanne is such a lovable character with flaws and a rawness that speaks to her trauma. She has such strength that she is not cognizant of, but as the readers, we understand the battle of survival she continually faces every day. Suzanne goes through an intense and complex development whereby she has to realise how she can better herself and work towards being in a happier state of mind. I must admit that the development of Suzanne and her healing is very slow. Which, again, is very realistic but in terms of a YA novel, I wanted slightly more of Suzanne being content with her decisions and her acceptance of help from her aunt and friends. I say this because the pivotal turning point where Suzanne starts making significant decisions for herself is regaled to the last couple of chapters, and I wanted to know more. Although, I did feel as though Fierce Fragile Hearts was more focused on the romantic elements of Suzanne’s life, and also peripherally on Caddy’s and Rosie’s also. I wouldn’t say that the friendship between the three girls was left behind, more so that it was in the background and was not focused on. Again, because of the taste of romance in the air. Which is fine, but I think the success of BBT was more so because of the focus on the friendship between the girls and how they support and love each other – and I just wish that this novel kept more of that within its plot. I quite enjoyed reading Suzanne’s perspective and felt her character was well-thought out and extremely realistic. She had such pain that you couldn’t help but feel hope for her future. I wanted Suzanne to succeed, I wanted her to realise her dreams, I wanted her to feel secure and loved. You just hoped so much for her reach as high as she wanted because she deserved it and so much more. I connected with her and cheered for her, cried with her and roared for her. However, I did find her extremely frustrating at times. I believe this frustration was more a result of being annoyed at the pettiness that could sometimes come through Suzanne, and also Caddy’s, characters. Suzanne would constantly point out the ‘thoughtlessness’ of people because they didn’t understand what it meant to have a hard life, or how to talk to someone who is an abuse survivor. I understood her position and at times, agreed with her. But the constant telling of this to the reader was not necessary and it became cumbersome. Additionally, Caddy was a character that I did not enjoy in this book. She was extremely petty and so within her own bubble of privilege that I could not be bothered with her at all. Even though I wanted more of the three girls together, I don’t think I could handle Caddy if she was one of the main characters. She wasn’t the most likeable character in this novel, especially after the fight she has with Suzanne and her reasons behind her anger. She is the most spoilt character, honestly. Though Rosie, Kellen, Matt, Brian and Sarah are good solid (albeit at times frustrating) characters, my all time favourite character was Dilys. She had my heart immediately. I adored her! Her perspective on life, the way she helped support Suzanne, her dog Clarence! I just loved her character and how she was there for Suzanne. *SPOILER ALERT*Goshdarn, I cried when Dilys passed away. Why you gotta do that Sara?! Although I enjoyed reading about Suzanne and her journey of healing, I feel as though it could’ve been more. The stunning nature of BBT was because of the deep friendship between Rosie, Caddy and Suzanne. I wanted more of the best friend magic. YA needs more books that are focused on female friendships that are supportive and full of love. As such, I give Fierce Fragile Hearts a 3.5 out of 5 stars. I hope you enjoyed my review, friends! Make sure to check out the other stops on the blog tour which can be found on the Pan Macmillan Australia website! Sara Barnard lives in Brighton and does all her best writing on trains. She loves books, book people and book things. She has been writing ever since she was too small to reach the ‘on’ switch on the family’s Amstrad computer. She gets her love of words from her dad, who made sure she always had books to read and introduced her to the wonders of second-hand bookshops at a young age. Sara is trying to visit every country in Europe, and has managed to reach thirteen with her best friend. She has also lived in Canada and worked in India. Her debut novel Beautiful Broken Things was shortlisted for the YA Book Prize and selected as part of Zoella’s Book Club. NOTE: I received a free ARC copy in exchange for an honest review. I want to thank Hannah Membrey and Pan Macmillan Australia for this opportunity! I just finished this book! I loved it so much, Sara Barnard is an amazing author. I really like your review, I definitely agree on it was a shame that the turning point was almost right at the end!